Displays the wireless band being configured.The following configuration relates to the 5GHz band. Check the box to enable the wireless function at all times. If you do not want to use wireless, uncheck the box to disable all wireless functions. To set a schedule for the times when you want the wireless network to be available, click on the Add New button to specify a new schedule. Here the user can manually select the preferred frequency band to use for this wireless network. The auto channel selection setting can be selected to allow this device to choose the channel with the least amount of interference. 36. The channel can be changed to fit the channel setting for an existing wireless network or to customize the wireless network. Select the transmission rate. It is strongly suggested to select Best (Automatic) for best performance. When using the 802.11n frequency band, user have an option to choose between a 20 MHz, 20/40 MHz, or 20/40/80 MHz bandwidth for 802.11ac. This option allows you to adjust the visibility of your SSID. If Visible is selected, the SSID of your wireless network will be visible to any wireless clients within range of the signal. If Invisible mode is selected, clients must search for the SSID of your wireless network manually in order to connect to the network. By default the wireless security of this router will be disabled. In this option the user can enable or disable wireless security for the frequency band 2.4GHz. There are two types of encryption that can be used: WEP or WPA/WPA2. For further information on these security types, please refer to “Wireless Security” on page 53. Wired Equivalent Privacy (WEP) is the most basic form of encryption that can be used for wireless networks. WEP is considered to be a relatively weak security method, however it provides more protection than an unsecured network. 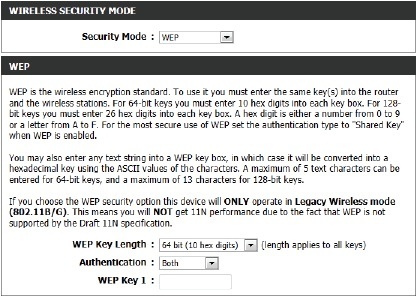 Older wireless adapters may only support WEP encryption. It is recommended that this method is used only if your wireless clients do not support WPA. Here the user can specify to either use a 64Bit or a 128Bit encrypted key. Authentication is a process by which the router verifies the identity of a network device that is attempting to join the wireless network. There are two types authentication for this device when using WEP. Open System allows all wireless devices to communicate with the router before they are required to provide the encryption key needed to gain access to the network. Shared Key requires any wireless device attempting to communicate with the router to provide the encryption key needed to access the network before they are allowed to communicate with the router. of 13 characters for 128-bit keys. Wi-Fi Protected Access (WPA) is the most advanced wireless encryption method used today. 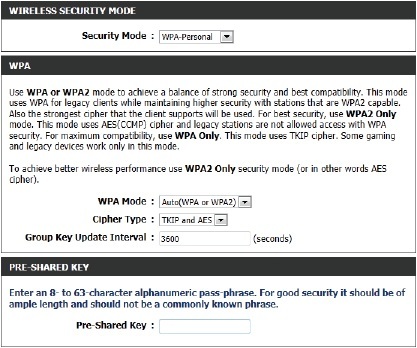 This is the recommended wireless security option.WPA supports two authentication frameworks. Personal (PSK) and Enterprise (EAP). Personal requires only the use of a passphrase (Pre-Shared Key) for security. Only option, the router associates only with clients that also support WPA2 security. Select the appropriate cipher type to use here. Options to choose from are Temporal Key Integrity Protocol (TKIP), Advanced Encryption Standard (AES), and Both (TKIP and AES). Enter the amount of time before the group key used for broadcast and multicast data is changed. to be able to connect to the wireless network successfully.